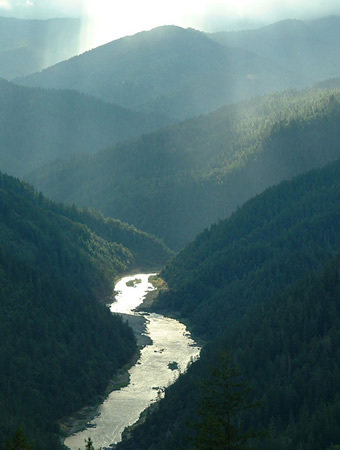 Why do we love the Rogue River? Few rivers offer the wide variety of benefits that make Oregon’s Wild & Scenic Rogue River one of the best all-around rafting trips in North America. Numerous but mostly moderate rapids, dependable water levels and predictable summer sunshine offer the perfect opportunity to get away for 3 to 5 days with family and friends for a unique and memorable river rafting adventure. Rugged and remote, the Rogue delivers post-card-perfect views with lush evergreen forests and rocky gorges as the river carves a dramatic canyon through the Siskiyou Mountains of southern Oregon. Rafters are treated to an abundance of wildlife with bald eagle, osprey, river otter and black bear a common sight along the river. A rich and fascinating history, complete with epic Indian battles, hermit feuds and the wild exploits of pioneering river runners give a depth of character to the river. Best of all, the Rogue River rewards rafters with over 50 rated rapids in 35 miles. Most of the rapids are fun and splashy but moderate (Class II and III), with Class IV Mule Creek Canyon and Blossom Bar providing the most memorable thrills. With mostly moderate rapids a Rogue River rafting trip is perfectly appropriate for families with kids and beginner rafters. Scenic riverside camps and plenty of opportunities for hiking, swimming, relaxing and exploring make the time spent off the river fun and enjoyable. You’ll find everything that’s best about a river trip on the Wild & Scenic Rogue.